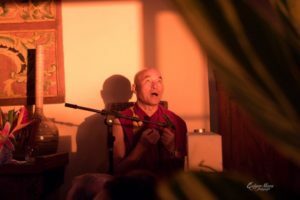 Lama Thubten Wangchen is a wonderful Tibetan priest and a special representative of the Dalai Lama. He was born in Tibet in 1954, and escaped to Nepal and India when he was a young boy. His mother was one of the many Tibetans killed in the invasion. He became a monk at 16 and entered Namgyal, the Dalia Lama’s private monastery. After 11 years at the monastery, he went to Spain as a translator and has been there ever since. He now directs the Fundación Casa del Tibet in Barcelona, Spain. Lama Wangchen states that when the Chinese came, “All of a sudden, the Chinese came with machine guns, military and cannons and we lost our country. The Tibetans couldn’t fight against the Chinese: we were a very small population of about seven million and one million were killed. Now [the Tibetans in Tibet] are about only six million and [there are about] eight million Chinese in Tibet. We are now a minority. There’s also a lot of discrimination between the Tibetan and the Chinese in Tibet … the better houses, jobs, wages and hospitals are for the Chinese people. Tibetans go to simple hospitals and simple schools. Above all, there are no human rights in Tibet, no freedom of religion in Tibet – or in China, either. In China there are no human rights and no freedom of religion. The Chinese say that the Tibet has religious freedom. How? The monks are not allowed to pray. They are prohibited [from doing so]. The families and monasteries in Tibet are all Buddhist and they want to have a Dalai Lama photo in the altar. It’s prohibited and considered a crime. If they have a Dalai Lama photo in their house or in the monastery, they are sent to jail just because they have the photo for their prayers. What religious freedom is that? All immigrants suffer. They’re not happy, because you have to leave your country and your home. You come into a new country were you don’t speak the language or know anybody. It’s a hard life, but if you’re open-minded, wherever you go becomes your world, your country, and your home. My house is your house. My country is your country. We are citizens of the world”.